BALTIMORE, MARYLAND - It pays to be one of the elite. David Rubenstein has doubled his fortune since 2009. Jamie Dimon has more than tripled his net worth. Stephen Schwarzman has increased his wealth six-fold. It's a remarkable showing given the economic and political tumult of the past decade, from Lehman Brothers to Brexit to Donald Trump. The fortunes of a dozen 2009 Davos attendees have soared by a combined $175 billion, even as median U.S. household wealth has stagnated, a Bloomberg analysis found. Data from UBS and PwC Billionaires Insights reports show that global billionaire wealth has grown from $3.4 trillion in 2009 to $8.9 trillion in 2017. Central bank actions to fight the financial crisis - record low interest rates and bond-buying programs - have underpinned this ballooning wealth by driving up the prices of stocks and other assets. Meanwhile, an Oxfam report tells us that the richest 26 people on the globe have as much wealth as the entire poorest half of humanity. Oxfam said the wealth of more than 2,200 billionaires across the globe had increased by $900bn in 2018 - or $2.5bn a day. 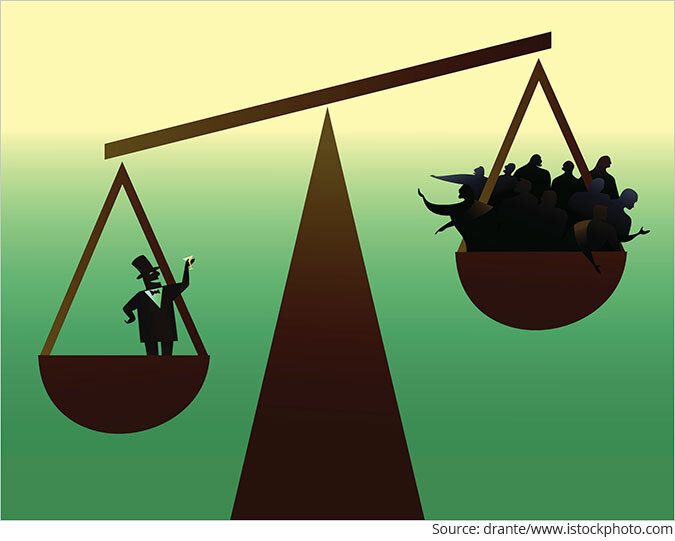 The 12% increase in the wealth of the very richest contrasted with a fall of 11% in the wealth of the poorest half of the world's population. As a result, the report concluded, the number of billionaires owning as much wealth as half the world's population fell from 43 in 2017 to 26 last year. In 2016 the number was 61. ...it's perhaps the most important work we have published ever, yet. I strongly urge you to download it...and read it right away. After all, it has the potential to dramatically change your life...for the better. As soon as you download, I will also automatically block a seat for you at the Rebirth of India MEGA SUMMIT. At the Summit, Senior Analyst and Co-head of Research, Tanushree Banerjee, will reveal full details about Rebirth of India... including specific opportunities to profit from it. Download the Report & Block Your Seat Now. It's Free. But not for nothing is envy one of the seven deadly sins. Wealth is relative. That's why it's so disagreeable watching someone else get rich. The average person has only his time to sell, by the hour. He's seen little improvement in the last 40 years. Hourly wages, properly adjusted for inflation, are flat. And six out of 10 Americans don't even have $1,000 in ready cash. So, let the bellyaching begin. Ten years ago, the Davos conference asked the question: "What must industry do to prevent a broad social backlash [against the rich]?" The answer probably wasn't "Double, triple, or sextuple the wealth of the most prominent conference attendees, while letting median household incomes stagnate back home." Yet that's what happened. Make no mistake: The backlash is coming. At least one billionaire is able to read the handwriting on the wall. Bridgewater founder Ray Dalio says that now, underway is "the beginning of thinking about politics and how that might affect economic policy beyond. Something like the talk of the 70 percent income tax, for example, will play a bigger role." None of this should be surprising to you, Dear Reader. Among the Davos crowd are the biggest stock owners on the planet. And since 2009, stocks, as measured by the Dow, have gone up 200%. No wonder they got so rich. Here at the Diary, we do not begrudge them their good fortune. But it wasn't "good fortune" alone. Instead, the fix was in. And whether the man on the street knows how it worked or not, he's beginning to resent it. And so, he turned his lonely eyes to DJT, in the hopes that the Great Disruptor would do something about it. Mr. Trump promised to "drain the swamp." Nobody knew what he meant by that, apparently not even Donald J. Trump himself. But whatever it might have meant, disrupting the rigged financial markets was not included. "The King of Debt" has made it very clear that he likes artificially low interest rates and has urged Fed chief Powell not to give them up. And now, seeing no progress from the White House, the lonely eyes turn from right to left. While DJT has no interest in "inequality" or in ending the financial flimflam at its heart, Ms. Alexandria Ocasio-Cortez (AOC) wants to stop it in the worst possible way. What happens to the money the feds tax away from the elite? Where does it go? Back to its rightful owners? Does it boost working-class wages? Does it buy a round of drinks at their neighborhood taverns or help repair their pickup trucks? It doesn't? What? You say the feds hand it out to their friends... the insiders, the cronies, the zombies, and the elite? Taxing undeserved stock market gains wouldn't upend the fake money system. It wouldn't put a stop to its distortions, malinvestments, and injustices. All it would do is put more money in the hands of the people who caused it in the first place, who protect it and benefit from it - the political elite. All governments are deeply conservative. They are in the protection racket. And the money, power, and status they protect are what exist now, not in the future. They care neither about the dead nor about the unborn. It's living, rich people who make campaign contributions. Smart people write editorials in The New York Times. The elite gets invited to Davos! Whatever the future has in store can damned well wait. Government is here to protect today's rich, not tomorrow's. And the fake money system is part of the program. People come to think what they have to think when they have to think it. So, as their wealth rose, the elite naturally came to think that manipulating interest rates was not such a bad idea. And now, none of them, right or left, wants to see it end. "Inequality" could be solved easily and honestly. Stop rigging interest rates. The free market can decide what rates should be. Most likely, it would discover rates that were much higher - probably over 5%. Then, in a flash, like champagne at Hiroshima, the post-2009 gains of the super-wealthy would evaporate. So far, neither AOC or DJT has suggested such an elegant repair. And don't hold your breath. We request your view! Post a comment on "The Billionaire Backlash Is Coming". Thank you for posting your view!